There are lots of myths about coffee, and how it might harm your health. The problem is – they’re simply not true. But where did these myths come from, and how did they take such a strong hold in our culture? The answer can pretty much be traced back to one man, and his incredibly clever and powerful advertising campaign. That man was C.W. Post, and the ad campaign was for his product Postum. There are lots of myths about coffee, and how it might harm your health. The problem is – they’re simply not true. Post was inspired by his time in Battle Creek, and set out to establish his own business making products out of grains, like Kellogg had done. Along with other cereals, such as Grape Nuts, and his own version of Corn Flakes, which he eventually called “Post Toasties,” he saw an opportunity to use the same grains from which he was making breakfast cereals to make a hot beverage. That beverage was called “Postum.” While Post had considerable competition from Kellogg in the cereal market, his biggest competitor in the hot beverage market was coffee. Understanding advertising and marketing very well, he set out on a dogged campaign to vilify his main competitor, inventing all manner of ills and negative effects from drinking coffee. The ad campaign worked, and Postum became hugely successful. It actually led the market in coffee alternatives right through most of the 20th Century, before the market for such beverages eventually died out as people got to understand more and more that coffee was actually quite good for one’s health. The early ads for Postum were quite ingenious. They talked about the dangers of caffeine, and even invented a comic character, “Mr. 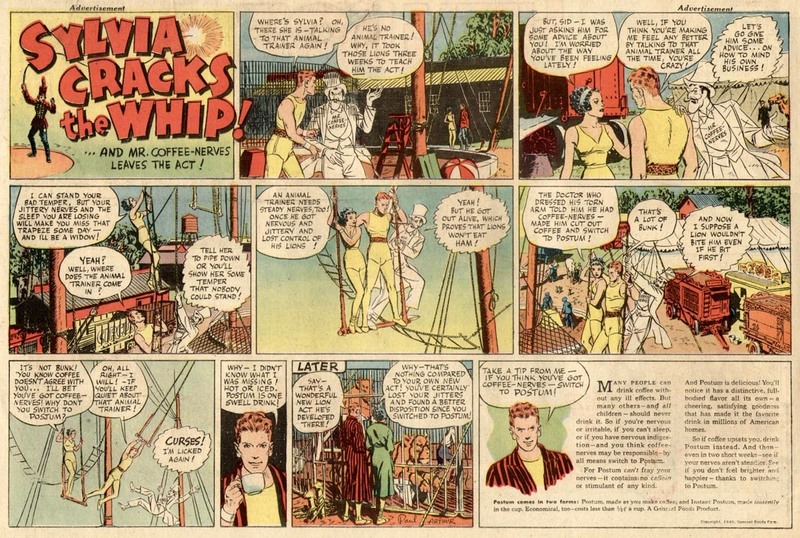 Coffee Nerves,” around whom they created comic strips warning of the dangers of coffee. Fortunately, modern science, aided by the internet, has now made it abundantly clear that coffee, rather than being a health hazard, actually has a number of remarkable health benefits. As for Postum… Kraft Foods held the license until 2007, when it discontinued production. A new company licensed the brand again in 2013, and it can now be bought in a handful of stores across the country, but by and large it’s a relic of a bygone era… and coffee is more popular than ever.